Ilya Viryachev’s 1 Resolve in Nature is painted on a group home in Vancouver’s Downtown Eastside. The piece underscores the value of being in green spaces as a way to find peace, resolve and to solve life’s challenges. Andrea Manica is a mural painter based in Toronto. She is often commissioned to paint garage doors and fences in the alleyways that twist through the city's residential neighbourhoods. In part, she says, her clients are motivated to have the art as a way to control the look of a surface that is likely to be covered in graffiti whether they like it or not. It's their way of having "meaningful or beautiful graffiti," she says, preventing the kind of senseless, scrawling tags that often mar urban spaces. Manica also believes homeowners are motivated because "a lot of people walk through and use the alleyways, so it's a nice place to have art. Maybe the piece will start a conversation." One of her most beautiful murals – a rainbow of 49 cascading roses on a deep black background – does exactly that. The composition is a memorial to last year's Orlando shooting, with a flower for each victim (the words "For Orlando" mark the bottom right corner). As a conversation starter among strangers, it acts as an important reminder of the healing role community plays after a crisis. Orlando, a memorial mural to the 2016 Orlando shooting, was painted by Andrea Manica in downtown Toronto. It features a flower for each victim of the attack. "Alleyways are not just a place where people park," she says. "A lot of people walk and bike there. So they are a nice place to have art." Bareket Kezwer is another Toronto-based muralist. 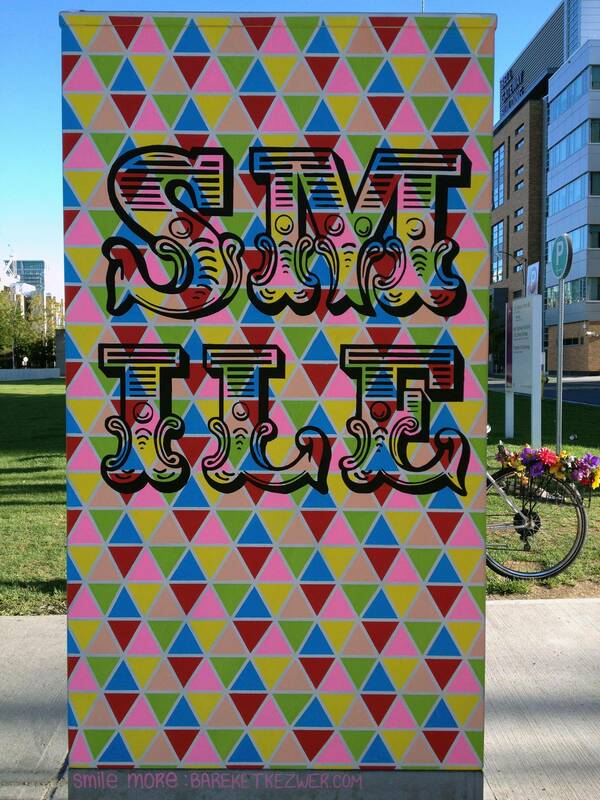 Her work can be found throughout the city and often features the word Smile in colourful graphics (locations are documented on her Instagram account, @365.smile). The simple, hopeful message is an antidote to the invasive advertising that surrounds us – the kind that tells us we aren't thin, pretty or smart enough, then offers remedies in the form of consumable goods. Maybe, as her work suggests, instead of cosmetics, what we need to feel happy is already within us. Lioness Mural, painted by Andrea Manica in downtown Toronto. The couple was excited by the prospect of bringing a street-art element into their home because "interior murals are also an exciting and underutilized medium," Bloch says, "and we wanted our mural to escape its frequent confines of children's rooms and garage doors, and enter our actual living space." Plus, "every day when we wake up, the mural reminds us to smile more and appreciate the colourful world around us," Wagman says. "Something we all need to do more of." Having unfamiliar, amateur artists wielding paint brushes in his home (including a woman from Belgium travelling Canada for a year, and a student from China on a trip to celebrate finishing university) didn't phase Wagman. "It was surprisingly comfortable having strangers in our house," says Wagman, who mainly left the crew unattended while they worked. "First of all, we had complete trust in Bareket to monitor the guests. More importantly, though, people are generally honest and respectful of being in someone else's home." For Kezwer, trusting others to execute her work (often in the homes of close friends, as are Wagman and Bloch) isn't stressful either. "I love painting with other people," she says, "especially novices, because it gives me a unique opportunity to connect with people around the themes of my work and the benefits of creating art." Something that characterizes both Kezwer's and Manica's work is that the subject matter isn't terribly controversial. On the contrary, if it's subversive at all, it's because it suggests feelings of hope and inclusion, as opposed to pointing out society's many faults (as is characteristic of much urban art by famous practitioners such as Banksy). Deer Door, painted by Andrea Manica in downtown Toronto. Ilya Viryachev, a Vancouver-based artist, takes a similar tact. He tends to save his "edgier" content for small-scale canvases (a series on the burial practices of modern life called Recycle Me When I Am Gone). When he is creating murals, though, he feels a responsibility putting his ideas into a public space. "How dare I impose dark things onto people. I just want to bring in a positive message," he says. A piece he completed for a group home in Vancouver's Downtown Eastside embodies his ideas. A woman looks wistfully off into the distance, ensconced in nature. The piece underscores the value of being in green spaces as a way to find peace, resolve and to solve life's challenges. "There is a lot of negativity in the world already," says Viryachev. Beautiful murals are a way to counter the trend.